NEW YORK—For a Ukrainian of Natalia Sonevytsky’s generation, house cleaning is a weekly, more often daily routine. She hasn’t cleaned her house in two months. These days, Sonevytsky, 79, wakes up and checks for news from Ukraine, and then calls her family there. They have grown increasingly anxious as the turmoil escalates. So has she. Between her volunteer job at the Ukrainian Museum and her roles in other organizations, Sonevytsky is glued to the news. An avid reader with a 40-year tenure as a librarian at Barnard College, she finds little time to read anything but the news. She doesn’t go out as much. And when she does, all talk turns to the trouble at home. “It really is absolutely devastating to see what is happening,” Sonevytsky, who lives in the Ukrainian enclave in the East Village, said. Just like overseas, many Ukrainians in New York believe different versions of what happened in Ukraine. Some, like Sonevytsky, side with the protesters in Maidan, also known as Independence Square, located in Kyiv, the capital of Ukraine in the western part of the country. They believe the protesters stood up for human rights and opposed corruption. Yet others think the opposite, seeing the protesters as armed rebels who took over the government illegally. But fear and anxiety grip all Ukrainians in New York—regardless of conviction. No one wants war. “In general, I feel extremely worried and sometimes terrified,” said Svetlana, 45, also from the East Village. Svetlana and several others who spoke with Epoch Times for this article did not want their last names to be used due to the sensitive nature of the subject. Ukrainians’ view of the conflict depends in large part on which area of the country they are from. 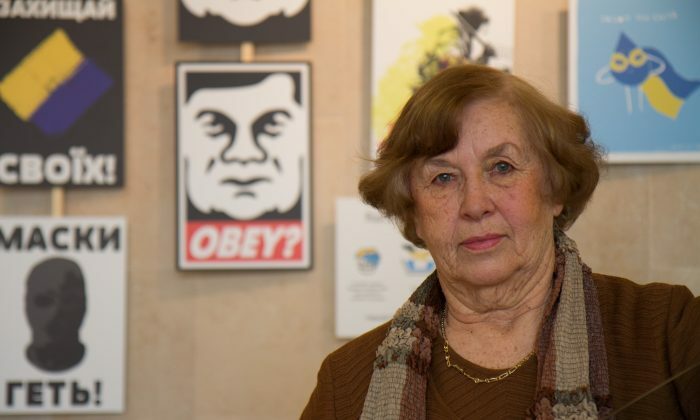 Sonevytsky, the retired librarian, was born in Lviv in Western Ukraine, which mostly sides with the protesters in Maidan, the square in Kyiv where the opposition encamped. Svetlana, the nonprofit manager, was born in Uman in Eastern Ukraine, which has strong Russian ties and where people view the Maidan protesters with skepticism, if not spite. What news media Ukrainians turn to plays a role as well. Russian television, mostly state controlled, fills its broadcasts with crowds waving Russian flags and reporters referring to the Maidan protesters as “club-wielding head cutters.” But Svetlana finds bias in Ukrainian and Western broadcasts as well, while saying Russian media has Ukraine’s interests in mind. Media bias can even splinter views within the same family. Julia H., a 28-year-old aspiring medical student, has family in the southern part of Ukraine that gets a lot of Russian channels. Her grandfather, after watching the news from the Russian perspective came to believe that “the people in Maidan are just crazy, doing violent things,” she said. But having access to different media in New York, she, on the other hand, supports the protesters. “Depending on the media, depending on where you live, people have different opinion of the situation,” Julia H. said. In the ocean of information, discerning truth from falsehood is difficult. Yarko Dobriansky, 31, of Brooklyn, has been told by his friends from Ukraine to take some posts down on social media because the reports came from what they said are unreliable sources. Dobriansky, who waits tables at Veselka Ukrainian restaurant in the East Village, is proud of the protesters who stood up for their country, but scared of what may happen next. He wakes up to the news and checks with friends in Ukraine to verify what he reads. “There is a lot of propaganda out there right now,” Dobriansky said. Though he was born in the United States, his father brought him up to “love freedom and learn Ukrainian culture,” Dobriansky said. An aspiring artist, he sings folk songs and dances as part of the Syzokryli, a traditional Ukrainian ensemble. On March 8, Dobriansky is scheduled to perform the Ukrainian national anthem at the New Jersey Devils hockey game. Dobriansky also joined protests in New York City to raise awareness of events in Ukraine. The largest such protest took place in Washington, D.C., Thursday. Dobriansky could not attend because he could not leave work. According to Ivanka Zojec, a member of the Ukrainian Coordinating Council, 11 busloads of Ukrainians headed to Washington from the tri-state area alone, adding up to the largest protest held by Ukrainians there since the 1960s. The Ukrainians on these buses oppose Russia’s invasion of Ukraine, something the Russian president has denied. In the bitter cold Thursday morning, Zojec waved down latecomers and guided them to one of three buses parked on Second Avenue. Across the street black-and-white photos, candles, and withered flowers lay at a sidewalk vigil for victims of the clashes on Maidan. “This is different countries, different communities combining together to make it known to the government that they have to do something to stop Putin,” Zojec said, referring to Ukrainian Tatars, Turks, Poles, Circassians, and Georgians expected at the protest. Inna said that she is singularly opposed to the ousted President Viktor Yanukovych, but does not approve of the violent methods protesters used. Julia H., an aspiring medical student, donated money for the people wounded in the protests. She had to cancel her trip to Ukraine due to fear of the conflict. Now she worries for her family. NEW YORK—A team of Ukrainian-American teens held a memorial in the East Village Sunday for people who were killed during protests in Kyiv, Ukraine.